© Marc Chavez, UCSD. Reprinted from Geotimes. By 2008, the NCLI slogan had become a popular rallying cry among youth organizations, fitness groups, and government agencies interested in promoting outdoor activities. Some wished to promote exercise, some appreciation of nature, and some awareness of recreational opportunities. 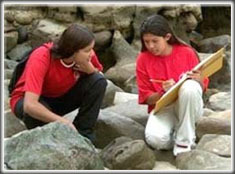 Working in partnership with the U.S. Geological Survey (USGS), AGI structured the first NCLI Day to promote Earth science education. Teachers led hundreds of students on a short hike from Langston Hughes Middle School in Reston, Va., to a nearby stream and wooded area. At a series of “learning stations” there, AGI and USGS scientists offered demonstrations and conducted discussions on topics such as water chemistry and biological diversity. Students sampled water, observed plant and animal life, and studied the interactions of natural systems in this hands-on exploration of Earth science. Before the day was over, students expressed what they had learned about Earth science in haikus, enjoyed a picnic lunch, and talked with NBC and NPR journalists who had arrived to cover this extraordinary educational event. Now NCLI Day is celebrated on the Tuesday of each Earth Science Week. But any day can be NCLI Day! Young people everywhere enjoy experiences that make learning fresh and exciting. Your students will, too. This guide contains all the information you need to begin planning your own NCLI Day. With the help of your colleagues, you can create an event that gets young people excited, shows the community what great things are happening at your school, and genuinely promotes high-quality, hands-on Earth science learning!